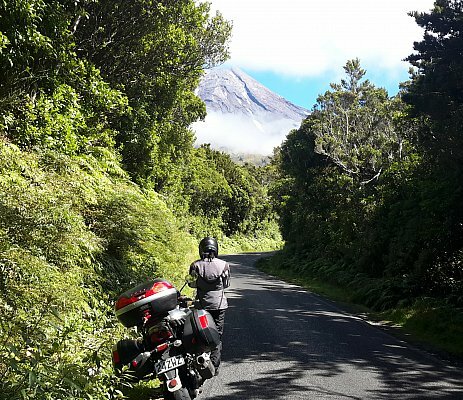 Touring by motorbike in New Zealand may just be some of the best riding you will experience. Why? New Zealand's geographical landscape is one of hills, mountains and one of the longest coastlines of any country. A wonderful network of sealed roads twist and turn along and around these through scenery that is world renowned. Just how much these roads twist and turn is what many of our visitors are amazed by. It really is motorcycling heaven! Traffic in New Zealand drives on the left hand side and our open road speed limit is 100km/h and urban limits of 50km/h. The large percentage of roads in New Zealand are tar sealed with some sections in the more remote areas being gravel. These gravel roads are often in very good condition and easily navigated on a motorcycle. Our range of adventure bikes are perfect for exploring these roads. New Zealand is divided into 2 main islands which are connected by a vehicular ferries that sail regularly. Some would argue that the South Island is the most scenic with the Southern Alps running the length of the island and its rugged and remote coastlines. The North Island however is often the favourite with customers because they feel it has the best motorcycling roads. They may well be right when you consider what is on offer in areas like the Coromandel Peninsula, the East Cape, the central Volcanic Plateau and what must be one of the best road names ever, The Forgotten World Highway. The total kilometres traveled by customers can vary greatly but on average around 6000km covers the touring of both islands with 12 to 14 days being the minimum time needed to see the best that North and South have. Ideally 3-4 weeks allows you to explore and experience the regions. Firstly, I would like to say thank you for the incredibly high standard of personal service you provided. As, someone who has previously hired bikes on several occasions in NZ, Tasmania and the UK, I can say that Auckland Motorbike Hire is head and shoulders above the rest. The condition of the bikes, the helpful friendly service and your willingness to help out, made our trip around NZ a pleasure. I will most certainly come back to Auckland Motorbike Hire for my next trip to NZ.